Brooklyn N.Y... There is good reason why the Polish American Congress chose Henryk Cioczek, M.D. Ph.D. as one of its honorees when it holds its Annual Awards Banquet at the Polish & Slavic Center in Greenpoint, Brooklyn on October 26th. Dr. Cioczek’s family is an outstanding example of Polish people who personally cared enough to risk being killed by the Nazis for trying to rescue Jews during the German occupation of Poland in World War II. 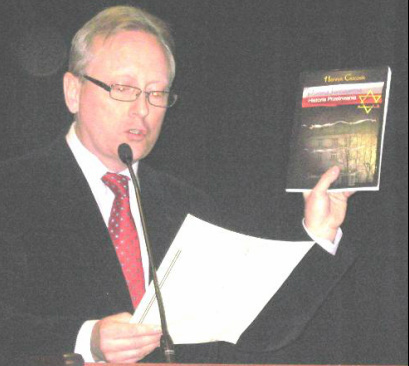 At last year’s observance of International Holocaust Remembrance Day at New York City’s Queens College, the Brooklyn oncologist presented a copy of the most recent book he published, “The Polish Jerusalem – A History of Endurance.” Dr. Cioczek described how both of his parents and both of his grandparents were awarded Israel’s Yad Vashem Medal of Honor as “Righteous Among the Nations” for their heroic achievements in saving the lives of Jews. Dr. Cioczek is now in possession of the medal and displayed it to the Queens College audience. along with the Jews they were trying to rescue, according to Dr. Cioczek. Holocaust and bear the guilt for it, rather than the Germans. declaration and protests of the Polish American Congress and called Auschwitz a Polish camp,” the Holocaust. Documentation Committee of the Polish American Congress stated.